A new, quirky little Burnside bistro brings seasonal dining eastward. 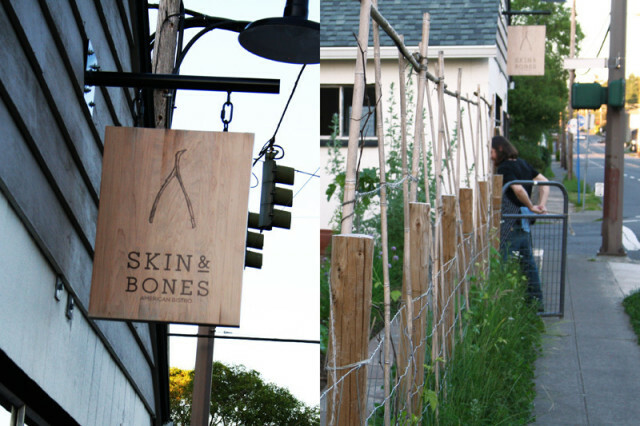 At first glance, the new Skin & Bones Bistro seems like a wrong address. Tucked away on a far eastern strip at E Burnside Street & 55th Avenue (the boonies of epicurean Portlandia), the outside of Caleb McBee’s new Northwest-inspired eatery looks, frankly, like an adult entertainment store. But within that shady, cinder-block exterior lies a foodie oasis, a tasty bridge between the Laurelhurst and Montvilla neighborhoods. Inside, Skin & Bones is open and convivial—a makeshift kitchen with the obligatory mason jars, Edison bulbs, and communal tables of Portland’s farmhouse chic. From over the kitchen counter, two heavily bearded Nordic types in stripes greet us. It’s easy to see how chef McBee’s aesthetic might have transferred over from Apotheke, his Scandinavian watering hole in the Pearl district that shuttered before its time in 2007. The ever-changing menu at Skin & Bones is small, affordable, and comforting, with simple flavors dictated by the weekly harvest. McBee slinks off behind the building into the gardens next door every hour or so to grab some fresh herbs or fledgling greens for his next customer. It’s the epitome of backyard-garden to table. The kitchen turns out a mean chicken galantine, warm and inviting with thick discs of juicy chicken bits, wrapped in a crisped, salty skin. 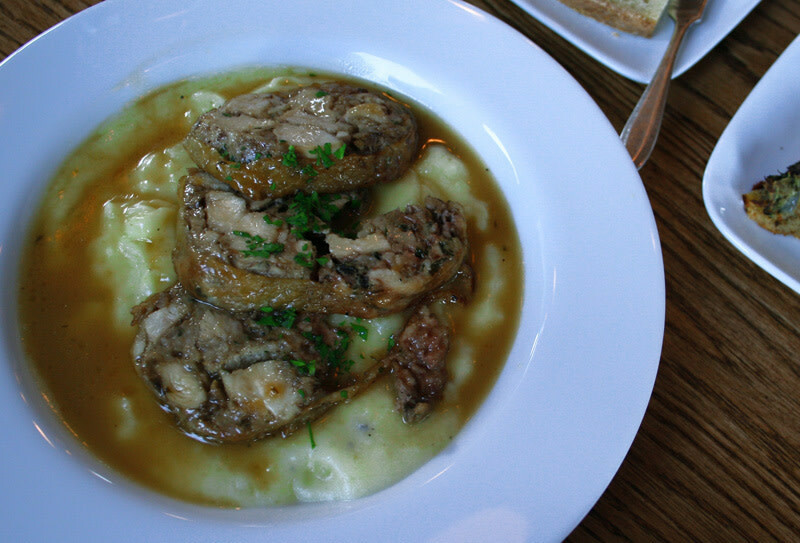 Riding a creamy raft of mashed potatoes and flooded with dark, sapid chicken stock, the dish is is meat n’ potatoes at its best. Potted duck tart arrives as a pair of flakey wedges layered with heavy sheds of duck meat and bitter kale below a nutty stratum of Comté cheese and blackberry reduction. Right now, the Skin & Bones menu practically screams early summer—and that goes for the desserts, too. 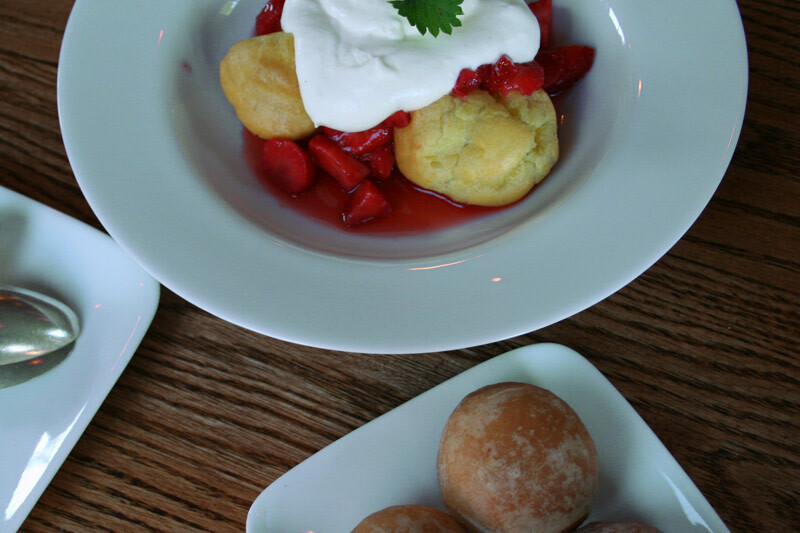 The strawberry and cream profiteroles are as good as they look; golden puffs that sop up the sweet red fruit, crowned with a dollop of melting whipped cream. The “Chelsea buns” too, are an exercise in restraint. The modest globes of eggy Challah bread come three to an order, covered in a thin veneer of icing and hiding a sour prune inside. Yummy. McBee says he chose the name because skin and bones represent “only the good stuff, the flavor of the best stocks.” Well said.